Remodeled Rustic Home with Lake Views & Boat Slip! Renovation in Progress: Book Now for Summer! Ideally located Lakefront on Falls Beach with Private Boat Dock! 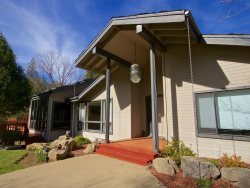 Bass Lake & Yosemite Large Four Bedroom Home with Boat Slip!